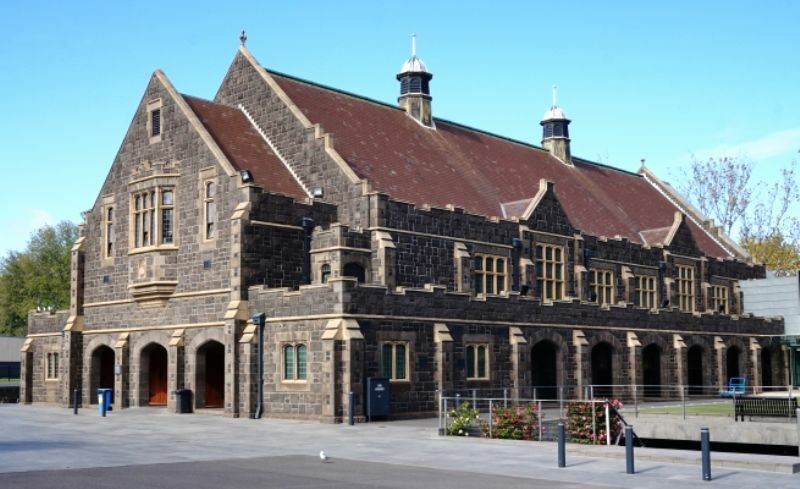 A hall commemorates `old boys` of the Melbourne Grammar School who enlisted in World War One. The hall was a gift of the "Old Melburnians Society" who were former pupils of the school. The foundation stone of the hall was laid in 1927 and the hall was opened by the Governor, Lord Stonehaven, on the 11th November 1928. The hall was refurbished in the early 2000s. 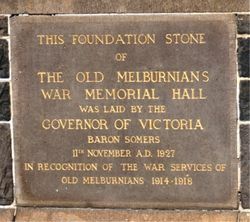 The Old Melburnians have decided to erect a spacious school hall, at a cost of between £20,000 and £25,000, as a tribute to those boys of Melbourne Grammar School who have enlisted. The committee responsible has deferred until today making an appeal, as it did not desire to interfere with the call to subscribe to war loans or patriotic funds. It now asks old boys to invest in the next war loan and to send their bonds or war savings certificates to the memorial fund as donations to that fund. Although the appeal in contemplation has been up to the present known to only a few persons, a substantial sum in bonds or donations has already been placed in the hands of the Old Melburnian Society. In the event of more than the sum required for the hall being subscribed, the balance will be made the nucleus of an endowment fund for the school. The memorial to Old Melburnians who have fallen will be placed in the school hall. Age (Melbourne), 24 August 1918.